... is a coin-operated U. S. mailbox for people who have letters to mail — and no stamps. It is a "self-serivce postoffice" that mails your letters withut need of adhesive stamps. To mail a letter you (1) drop money in coin slot (2) dial correct postage denomination (3) insert letter in letter slot. The machine does the rest: automatically takes your letter, prints postage and postmark on it, and holds it for collection ... provides posttage from 1c to 33c, including Air Mail, Special Delivery, etc., with no premium for postage. Metered mail needs less postoffice handling, often catches earlier trains and planes, starts on its way sooner. The "Mailomat" is a pre-war invention of Pitney-Bowes Postage Meter Co., Stamford, Conn., now converted to war production; was develioped in cooperation with the U. S. Post Office Dept. to facilitate public use of the mails in post office lobbies, railway terminals, etc. Manufacturing will begin when the war is won. Try this new "stampless" postal service now. Use this card to say "hello" to that boy in Service. And when using the mails these days, at home or office, remember to mail early and often ... to help clear the track for war mail ... and to help the Post Office help you! 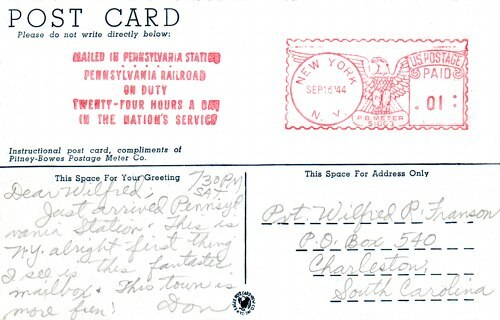 According to the National Postal Museum at the Smithsonian, the first Mailomat was placed in public service in New York City on 17 May 1939; I suppose it was this one for rail commuters and travelers at the always-busy Pennsylvania Station. My Uncle Don, being a science-fiction fan as well as a prolific correspondent, naturaly was enchanted by the neat mailing machine; and knew my father would be as well. 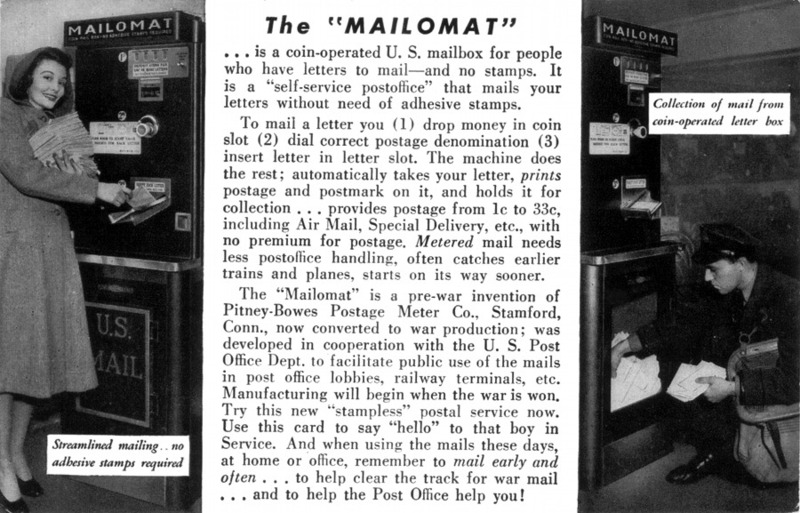 Even before the Mailomat, the U.S. Post Office was devising schemes to reduce manpower and replace people with automatic machinery at every level of scale from cancellation to post office. Successive waves of attempted automation set in after World War II. A key step was the minimization of adhesive stamps, what we normally think of as "postage stamps", and which still form the heart of stamp collecting and the postal hobbies in general. But Post Office procedures increasingly over the years avoided using stamps. 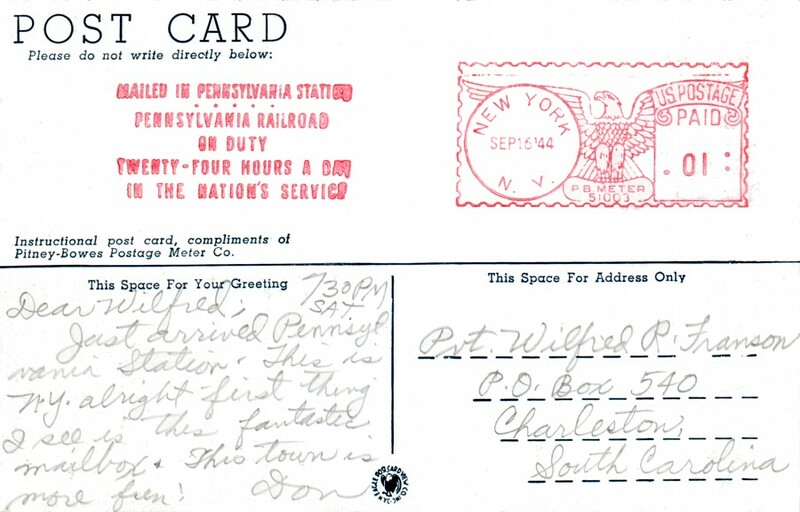 The National Postal Museum has a fairly detailed history of American postal automation: Machines or Bust: Post Office Department Research and Development, 1945-1970 by Kevin Danchisko.